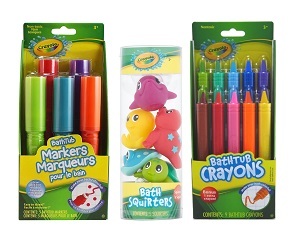 These soft and colorful Crayola Bathtub crayons are perfect for little hands to manage. Crayon washes off with a sponge and hot water. Perfect for inspiring great imagination. Set comes with nine brightly colored bathtub crayons. Bring joy to your children by adding these loveable squirters to your kids' bath time. These colorful sea creatures make bath time more enjoyable. Recommended for ages 3 and up. see packaging. Recommended for ages 3 and up.